Wyvern was already a strong passing formation to the left side, now Junction gives it a boost to the right side and over the middle. The go to route in this play is the slant out-and-up on the right, often matched up against an isolated CB. With CBs matching up with the offensive formation on nearly every play in Madden 2006 this route will get a lot of room to work with outside. If it does draw additional coverage this should open up the middle for the slant and drag routes that follow behind it. The three routes form a triple threat that the QB can read and throw very quickly, without a lot of scanning back and forth across the field. This is a good thing because a disadvantage of the compactness of the Wyvern formation is that it makes it easier for the defense to disguise and execute blitzes. Three quick reads, two of which are over the middle make for solid blitz counters, though tight quarters means that a few passes will be batted down at the line. 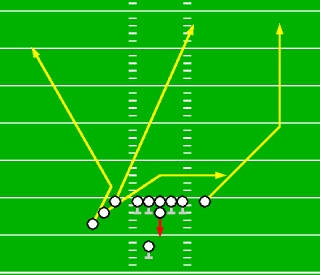 These rarely lead to interceptions in my experience, so the risk with the short routes is not too great. Pass protection in this play is not great, and because of Wyvern's lack of running power the defense will likely be taking wide rushes to generate pressure and try to get a sack. Sliding the protection to the naked right side and motioning the RB will give the QB some room to roll out a bit and buy an extra half second or so in the pocket. Even with these techniques you will rarely have time to throw the deep sideline or corner routes, so concentrate on making quick throws, hitting receivers in stride and letting them run after the catch. See the Madden Playbook Guide for a description of these symbols. The slant out is money against man coverage, especially in Madden 2006 where the CB will line up tight inside. It rarely draws bump coverage but still tends to be less effective against both press and zones due to multiple defenders being in the area. Next look inside to the slant and drag. I like to read these routes together, the key being the MLB assignment. If he blitzes, drops down tight to cover the drag or simply does not take a deep drop you can hit the slant over the MLB's head but underneath the safeties with a well timed pass. If the MLB does drop off you can usually hit the drag route underneath as it crosses past the right guard and tackle. Just watch out for this WR getting caught up in traffic near the line of scrimmage. Next look a bit farther left to the angled corner route. Against the blitz you can occasionally hit this on the slant portion but I use it almost exclusively for the deep corner throw. This throw takes practice to get right, it's a shallow corner so any lob pass could be undercut by the safety. Be sure to throw it deep and to the outside shoulder to take away the angle for the safety. Finally, the right SE will turn up the sideline late. It's rare to be able to hold onto the ball long enough for this throw except against a weak pass rush, so expect double coverage here. Contact Arkaein with any comments or questions regarding the Monstrous Madden Playbook.